Hypnosis is a state of altered awareness in which the imagination rather than the intellect is active. It cannot be forced upon people - it is a state which clients allow themselves to enter. In this sense all hypnosis is - self hypnosis. Hypnosis has been around for thousands of years, it is simply a relaxed, focused state of concentration. You do it almost every day. Every time you daydream, or visualise an event in the past or future, that's hypnosis. Our Immune function is dramatically affected by our thoughts. In Hypnosis the immune function can be enhanced or suppressed contributing to the healing process. Hypnosis Downloads offers hundreds of sessions using the best type of hypnosis. Hypnosis is simply a deliberate utilization of the REM (Rapid Eye Movement) or dream state. We're not giving people medication here � if it wasn't a natural ability, hypnosis wouldn't work! Crazy news stories, stage hypnotists and gossip have created the illusion that you lose control in hypnosis. In fact, when hypnotized, you are relaxed and focused � and able to choose to get up and walk away at any time. You choose to give your attention to the hypnotist, and you can withdraw it at any time. If you have been scared of hypnosis in the past, this article has hopefully convinced you to at least give it a try. "Myth's" Article by Mark Tyrrell of Hypnosis Downloads. You do not go �to sleep�. You are in an alternative state of consciousness with a very narrow focus of attention. You can hear everything that is being said. Nothing happens without your consent. You have absolute control. However, you are extremely relaxed. In the last few years, Hypnosis has become a primary tool in Diet and Weight control, gaining massive ammounts of publicity - as in the article below in an issue of Shape Magazine. In it, Harvard Medical School hypnosis professor Jean Fain rated the top audio programs. 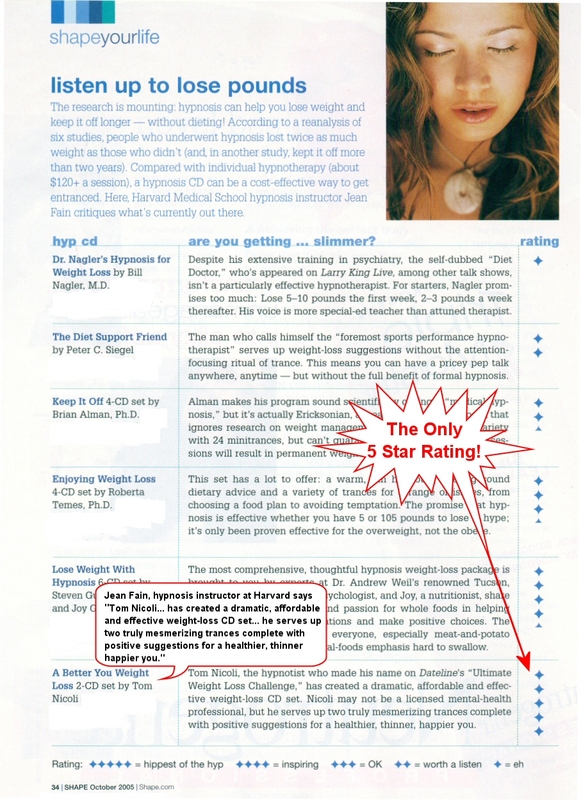 Only one Weight Loss CD set was awarded the highest 5 Star rating. Are there certain illnesses/conditions which are proven to respond positively to hypnosis? Ernest Rossi, (Psychobiology of Mind Body Healing, 1993, Norton Publishing) has catalogued a number of maladies that seem to improve, implicating at least three major body systems in the mind/body healing response. Modern Hypnotherapists use hypnosis not only for medical purposes, but also as an aid for the resolution of many problems that are Psychological in origin. Hypnosis is used for pain control, can free people from Phobias and Compulsions, is useful for effective Weight-Control, increasing Work/Study/Sports performance, improving Memory and Concentration, boosting Self-Confidence and Self-Esteem, helping us achieve more of the true potential we all possess. You might want to take a look at below. great king... come with power to heal!" The Scottish physician James Braid named hypnosis (an abbreviation from 'neurohypnosis') after Hypnos, the Greek god of sleep (Latin name: Somnus). Hypnos was one of the many relatively minor and very ancient deities of the Greek pantheon. The similarities in appearance and behaviour between the god of Sleep and Hermes (Latin: Mercury) are so apparent, however, that it is compelling to speculate that the two are linked, or that Hypnos is in some way a particular aspect of Hermes. Hermes was one of the major Olympian gods and appeared later than Hypnos, it is probable that as Greek civilisation developed the minor, rural deities were absorbed into the official Olympian pantheon in this way. Hypnos the Bountiful, as he was known by the ancients, rests in the arms of his mother Nyx (Night). His father is Erebus, the pure darkness of Hades, the Underworld. Hypnos dwells with his twin brother Thanatos, god of Death, in a dark cave by the banks of the river Lethe (Oblivion), at the entrance to Hades. The cave is surrounded by opium poppies and other sleep-inducing herbs. Hypnos is a gentle and benevolent god who sometimes takes the form of a singing bird, sometimes that of a winged youth or old man. He carries a drinking horn, from which he pours sleep-inducing opium. He is most beloved of the Muses, and his spouse is Pasithea, one of the Charities. Together they have three children, Morpheus, Phobetor, and Phantasus who occupy the dreams of men. Morpheus appears in human form in our dreams, Phobetor as birds and animals, and Phantasus as all the animate objects of our dreams. Hypnos delivers mortals from pain and mental suffering, with the help of his sons and his brother Oniros (Dream) he colours their sleep with dreams. Hypnos opens two gates, the Gates of Horn and Ivory, through which Oniros comes into the minds of men. Through the Gates of Horn come prophetic dreams, and through the Gates of Ivory come deceptive dreams which mislead. Copyright © 2000 - 2013 John Quigley & CosmicTraveller.com. All rights reserved.